It’s a tale as old as time: A former vice-presidential nominee and her family roll up to an alcohol-soaked party in a stretch Hummer limousine, only to find themselves at the center of a bare-knuckle melee involving 20 people. OK, so maybe the brawl that Sarah Palin and several members of her family were involved in last Saturday night isn’t exactly the type of story you expect to hear about someone who was nearly elected to the nation’s second highest office six years ago. But with The Washington Post, “Good Morning America,” the New York Times and dozens of other media outlets all filing reports on the incident over the last few days, it’s clear that there’s a high level of interest in the events that transpired on that regrettable night in Anchorage. Palin has not commented publicly on the episode, and there is little doubt that the former Alaska governor would rather talk about anything else. But RealClearPolitics spoke with a source close to the Palin family, who wanted to provide their version of the events in question. What no one disputes is that several members of the former first family of Alaska arrived at a well-attended birthday party, at which several competitive snowmobile racers were present. Todd Palin, himself an elite racer of “snow machines” (as the vehicles are known in the 49th state), was celebrating his 50th birthday that night, though the party was not being held on his behalf. With a live band, dancing, and the former governor rocking red-white-and-blue high-tops, everyone seemed to be having a good time. But then, some words were exchanged. And that’s where the stories diverge significantly. According to previously published eyewitness reports, the fracas began when Track Palin, the former governor’s adult son, confronted a former boyfriend of his 20-year-old sister, Willow. But according to the Palin family’s version of events, the instigator was actually the former boyfriend. Track Palin soon found himself struggling to fend off four men who had “piled on him,” according to the source. Todd Palin then inserted himself into the brawl, which left the former “First Dude” of Alaska bleeding. Next, it was Sarah Palin’s turn to leave her own mark on the most talked about rumble in Anchorage since the 1964 earthquake. On the previous night, she had been in Houston to speak at a fundraiser benefiting the Mighty Oaks Warrior Foundation, which helps wounded veterans. That event apparently was fresh on Palin’s mind when she engaged in the tumult on Saturday night. Over the years, Sarah Palin has spoken frequently about her son’s U.S. Army service in the Iraq War, and Track currently serves as a counselor, working with veterans suffering from post-traumatic stress disorder. 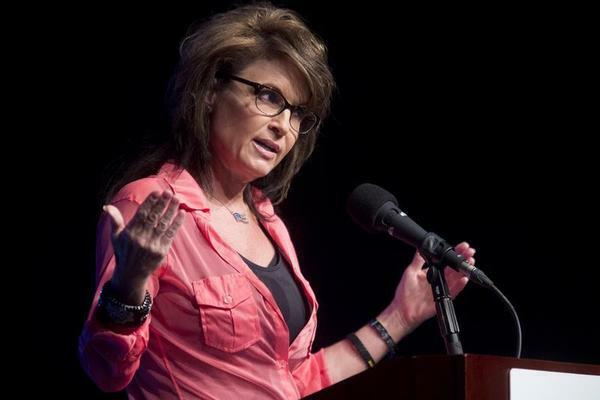 “From my understanding, she was in full ‘mama grizzly’ mode defending the kids,” the source said of Sarah Palin’s mindset. According to the source, Track Palin left the fight nursing four cracked ribs, while his father was bloodied up. At some point, Bristol Palin became involved in the free-for-all, but the Palin source took issue with a report suggesting she had brandished a “mean right hook,” noting that the eldest Palin daughter is left-handed. The Anchorage Police Department confirmed that there were about 20 people involved in the ruckus and that while no one wanted to press charges, an investigation is ongoing.